Why go and rent a video from a shop if you can watch online? With a successful online movie service established in Canada and the US, YouTube has now launched this option in the UK. It’s cheaper than renting from a shop, and of course, there’s considerably more choice. You also get longer to watch your film with an online service – YouTube makes titles available for 30 days. Once you’ve started playing a film, you get 48 hours to finish watching it. 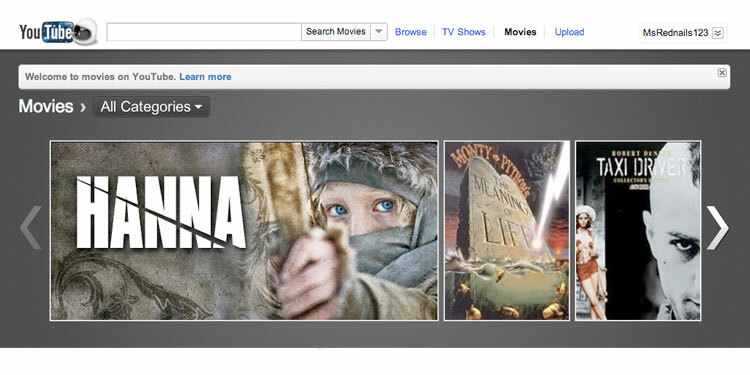 YouTube’s main UK competitor will be Amazon-owned LoveFilm. With YouTube, it’s £3.49 to rent a new release, and between £2.49 and £3.29 for other films. LoveFilm comes in at a slight price advantage with new releases available for between £2.49 and £3.49. LoveFilm also offers an impressive selection of films to watch for free, including titles such as Elizabeth 1, Samurai Commando, and Joy Division. Perhaps YouTube will still come out on top, though, simply due to the fact that they are so high-traffic already. According to nielsenwire, the site attracts a massive 100 million unique viewers each month. To these many visitors, renting a film from YouTube will perhaps be a natural step on from watching short videos on there. The other main difference between the two sites is the range of service offered. YouTube keeps it simple with just online rental, whereas LoveFilm, having been around for longer, still fulfils its traditional role of sending DVDs through the post. They also offer games online and films/games streamed to users’ PSPs and TVS, along with their online service. LoveFilm offers a number of price packages to keep users loyal, whereas YoutTbe keeps it simple again with a pay-per-view service. Either way, when it comes down to simply watching video online, both services are really pretty similar in what they offer – and both have strong appeal – popping on to the sites and seeing a bunch of interesting films to rent for £2 to £4 is certainly a big draw. What do people prefer? The YouTube or Lovefilm offerings. We have a suspicion that YouTube will rain supreme but would love to hear what you think, as ever, via our comments section. If you fancy making your own video production for your business, please get in touch. My Social Agency offers a range of dynamic HD web video services from corporate business videos to viral videos.